The election is the most closely fought election ever in Singapore where PAP has been used to walkovers in half of the seats contested. Almost all -except 1 GRC were contested this time by mainly new candidates with professional backgrounds. These new candidates seems to capture high votes despite close shave with victory. They should not feel too disappointed since the election system in Singapore has given huge handicap to the PAP who some how believe in survival of the fittest! An important repercussion from the Singapore elections is the impact it may have in Johor where UMNO reign just like the PAP in Singapore. PAP is returned to government around 1.33am. It is clear that the slide in PAP’s votes could have been much larger if not for the followijg factors: 1.the pre-election gerrymandering-or Harry-mandering, given that Lee Kuan yew was known as Harry in his younger days; 2. massive vote-buying during elections; 3. lack of civil liberty and democratic rights in between elections, which conditioned the voters to only feel safe to vote PAP which purposely confuse the people by pretending themselves to be identical to the government. The ruling PAP is shaken to its core despite such a `win’ because they know that without the unlevel playing field and handicap they could have been consigned to history sooner than later. The sense of solidarity at the mass gatherings during the election must have boosted the collective confidence of Singaporean voters -there is no turning back for the Singaporean dictator who was finally forced to apologise for their mistakes and misdeeds in past decades. These are some of the 1sts achieved in this election for the Singaporean people. Even though the seats gain do not reflect the votes gain by the opposition the Opposition has set the tone of the elections-which is the objection to strong man politics as embodied by the 87 year old Lee Kuan Yew who still insist on contesting his seat. Lee’s threat to sideline Aljuneid’s development aroused strong objection from the public and contributed to the win by Workers Party in the 1st ever Group Representation Constituency by the Opposition. Such anti-authoritarian demands from the people means that the Singaporean voters has finally become one of the last members of the South East Asian countries to embrace democratisation politics. What I predicted turns out to be roughly correct. Opposition will win more votes & seats. Opp got 40% of votes but won 6 seats. 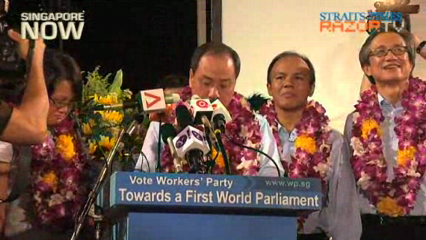 This is the first time, the Opposition has won a GRC. PAP has gradually lost popular votes. In 2011 PAP got 75%, 2006 66% and 2011 60%. Whether you like LKY or not, you have to admit he and his team have brought Singapore to what it is today. LKY has kept Singapore relatively free of corruption. This is remarkable achievement. Singapore, a city state of area 712 sq km + lack of resources has the 2nd highest standard of living in Asia. Singaporeans will appreciate LKY if they go to African countries which are about 20 to 30 years behind. Africans are more concern about getting meals on the table. Many do NOT vote or know when is the election. Singapore development has come with doing away with freedom and democracy. Charlie Rose said LKY has tight control over Singapore in Bloomberg. LKY replied by roughly asking which govt will make conditions favourable to the opposition. LKY said he had not many years left. If the present trend of voting continues, PAP may lose power in 2021 General Election !!!!!! LKY will not be there to witness it. A real tsunami may just engulf the whole of Singapore from a massive earthquake in Indonesia !!! GRC is a double edged sword. Delineation may be counter-productive. What must PAP do to regain popular support from an educated and well informed population which has lost its “fear” of voting for the opposition. 1. Reduce cost of living in food, public transport, homes. 2. Reduce the salaries of PM and Ministers. Consider it a great honour & privilege to serve. I don’t mind being PM of Singapore for 5 years for free. absolutely necessary. Singapore is a small place. 6. Listen to the people. Let the people have their say. People want to be empowered & be part of the solution. Smart people do NOT necessary make GOOD LEADERS. Smart people may not have excellent psychosocial skills. Change. PAP cannot wait for the UNTINKABLE to happen. of Singapore people ??? Of course not. 8. There must be Compassion. No matter how powerful a person is, one day he will fall. One day our Solar System will just vanish by the Cycle of the Universe. No amount of planning will save us. It is not how much you have that is important. Everyday, try to make somebody happy. Hello Dr Chan, may I know why your comment went tangential and mentioned a tsunami due to an earthquake from Indonesia? What has that got to do with the elections?